DIRECTIONS for data interpretation questions 1 to 4: Study the tables given below and answer the questions that follow. Explanation: The size of the banks can be assessed by dividing assets by number of banks. India's GDP is how many times the GDP of Singapore? Explanation: The smallest banks will be given by total assets divided by the number of banks. Hence 5. Explanation: There is no need to calculate GDP of China and Japan as these two are mentioned in all the options. We need to confirm which country is the third largest. So, solving for each of the countries given. We get the value of India, at 162/0.14= 1,157 b $ is the third largest. 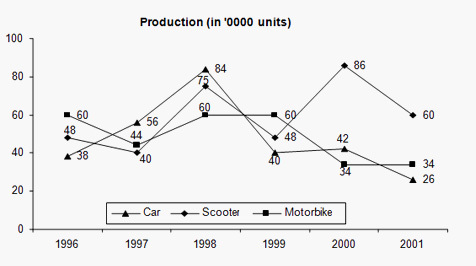 DIRECTIONS for questions 5 to 7:Study the following line graphs which show the production (in '0000 units) and percentage exports of scooters, motorbikes and cars respectively over the years. In which of the following years was the production of cars more than 50% of the total production? Explanation: For 2000, total production is (34 + 42 + 86)0000 = 1620000 units. Production of cars in 2000 = 420000. Percentage is less than 50%. For 2001, total production is (26 + 34 + 60)0000 = 1200000 units. Production of cars in 2001 = 260000. Percentage is less than 50%. For 1998, total production is (60 + 75 + 84)0000 = 2190000 units. Production of cars in 1998 = 840000. Percentage is less than 50%. Hence answer is none of these. Hence 4th option. Find the total number of automobiles exported in the year 1999. Explanation: Number of cars exported = 400000 × 0.1 = 40000. Total automobiles exported = 120000 + 57600 + 40000 = 217600. Hence 3 rd option. Find the ratio of cars, scooters and motorbikes exported in 1996. (0.42) (38) : (0.28) (48) : (0.35) (60) = 19:16:25. Hence answer is 3rd option. DIRECTIONS for questions 8 to 10: The pie charts below represent the popularity of ice-cream flavours in the state of Gujarat. In 1995, if 20 % of the “Other” category is mango flavor, and 4,212 people surveyed preferred mango, then how many people were surveyed? Sample = 21060/21.06 x 100 = 100,000. Hence 4. If a percentage point shift results in annual additional sales of Rs. 50,000, how much in Rupees, did combined annual butter-scotch and chocolate chip sales increase between 1985 and 1995? Explanation: [(12.54 + 9.88) – (8.81 + 8.23)] x 50 k. Hence 5. Which of the following can be deduced from the above pie-charts? Both the butterscotch and vanilla percentages increased by more than 33 % between 1985 and 1995. A higher percentage of people chose butterscotch and strawberry in 1985 than chose butterscotch and chocolate chip in 1995. 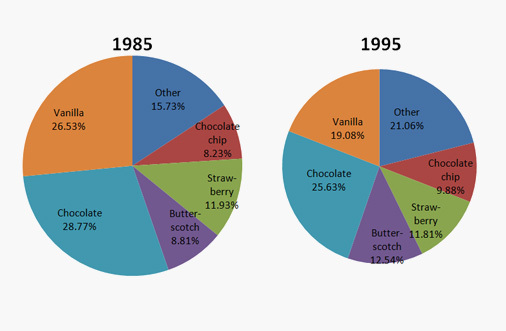 The total share of vanilla, chocolate and strawberry decreased by less than 20 percent from 1985 to 1995. II ) Please note that it is butterscotch and chocolate chip.